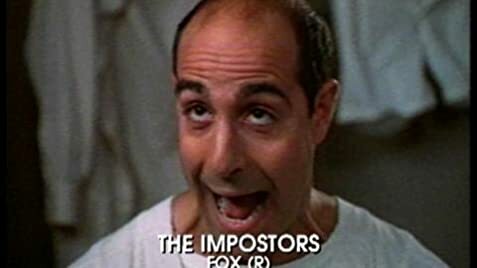 Rented THE IMPOSTORS for the first time on Friday and by the end of the weekend had watched it 4 times - and yes, I do have a life. Blithe is the only word I can use to describe the experience of watching this video. In a world of multi-screen theaters that show a variation of 3 basic movies - mindless action, gross-out comedy, or big-screen version of the issue of the week - THE IMPOSTERS was a homage to an earlier genre - the silly, almost plotless comedies of Laura & Hardy. Homage - not remake - an important difference. This was definitely a 1990's movie - more quirky than slapstick, with slick production values. A series of vingettes, tied together to make a whole, yet each scene easily stands on its own as a comic gem - the initial credits being my personal favorite. One final word - all this and a great cast! and score. This movie was a rare 10. Stanley Tucci and Oliver Platt first met at Yale University where they developed the characters of the two unemployed actors that they play in this film. The song, "Skokiaan" is used in the movie which takes place in the 1930s. However, "Skokiaan" was not released until 1947. As the closing credits roll, the entire cast performs a line dance, starting on the ocean liner set and working their way out of the soundstage.